The Yser front north of Ypres is a forgotten sector of the Western Front. It linked the Ypres Salient with the Belgian coast and for most of its length the front lines straddled the Yser Canal; with the Belgian Army dug in on the west bank and the Germans on the opposite bank. Nearly 30,000 Belgian soldiers were killed on this front which remained pretty static for most of the Great War until the final offensives of 1918. This photograph, from a series of stereocards, shows Belgian troops in a typical trench on the Yser front in early 1917. 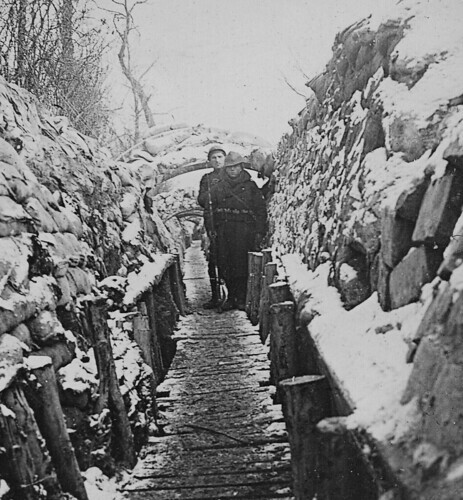 It is a fairly basic straight trench, not zig-zagged for extra protection, and with a basic duckboard floor. The trench is also more of a breastwork than a trench dug in the ground, as this pretty much reflected the flood conditions that prevailed on this part of the front where digging in on the surface was impossible. High sandbag walls protect the trench occupants, two of whom are seen here in typical Belgian uniforms of the period. This entry was posted on 07/12/2012 by sommecourt. It was filed under Belgian Army, Belgium, Flanders, Forgotten Fronts, Great War, Trenches, Western Front, WW1 and was tagged with 1917, Belgian Army, Belgium, Flanders, Nieuport, Trenches, WW1, Yser.